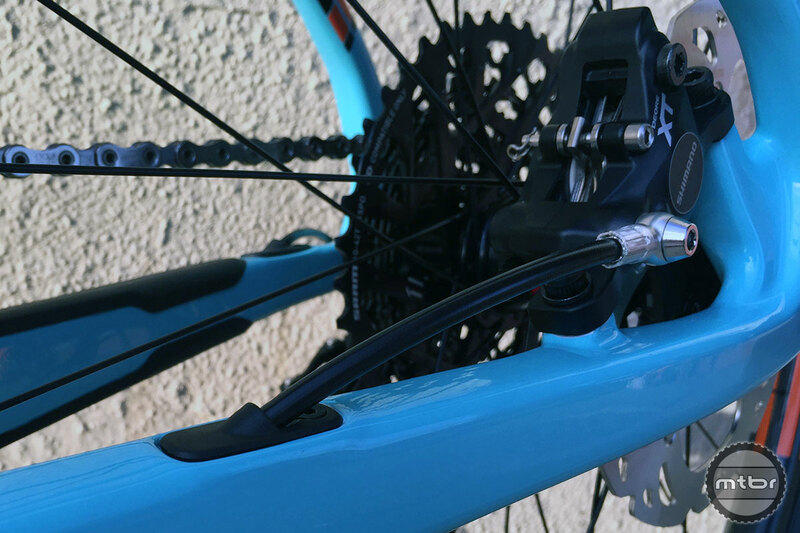 Features include a direct mount front derailleur, 27.2mm seatpost, 15mm thru-axle fork, full carbon dropouts and disc mounts, two bottle cage mounts, 142mm rear axle spacing, and a threaded bottom bracket shell. 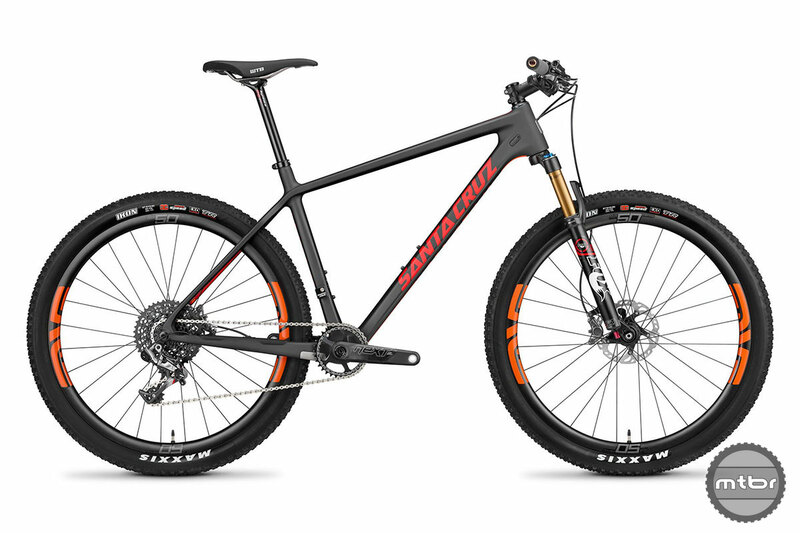 Santa Cruz has launched a revised version of its 29er Highball carbon hardtail, and added a 27.5-inch Highball to its line-up. 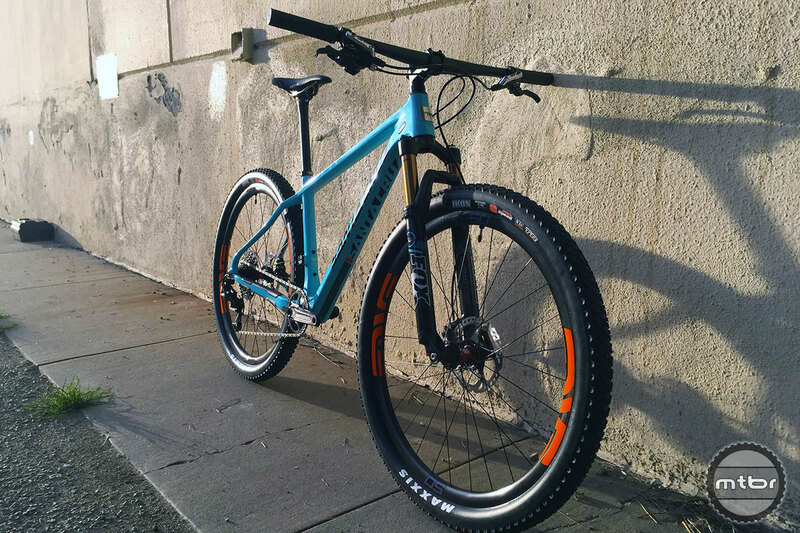 Geometry has been adjusted from the previous iteration, with a longer front end and shorter chainstays, the goal being a snappier, more nimble ride. They claim to have tuned the seat stays and seat tube layup to provide more vertical compliance and a more comfortable ride than the previous generation. Cable routing has also been updated, and is now fully internal with easy-to-route guides and cable tunnels. The bikes share similar geometries with slight alterations to accommodate wheel size variations. The 29-inch version has a 70.5-degree head tube angle and 71-degree seat angle, while the 27.5 has a 69-degree head angle and 72.5-degree seat angle. 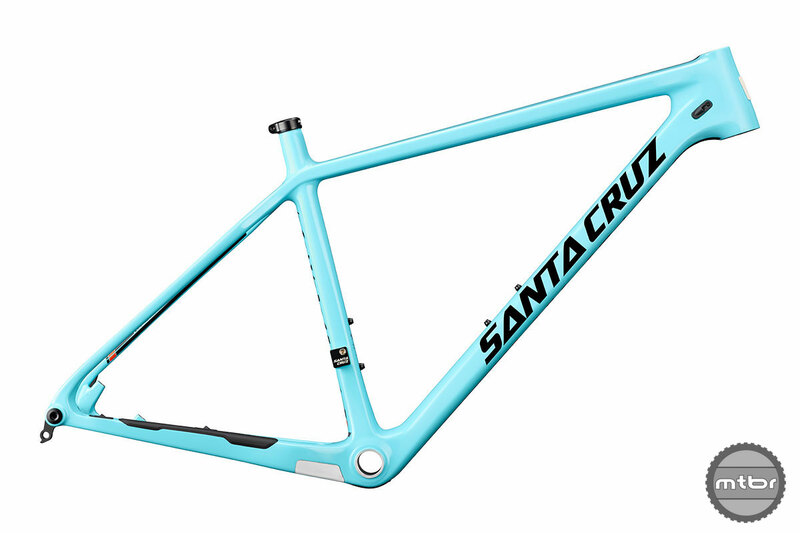 Santa Cruz also released a new carbon cyclocross bike today. Read that story here. 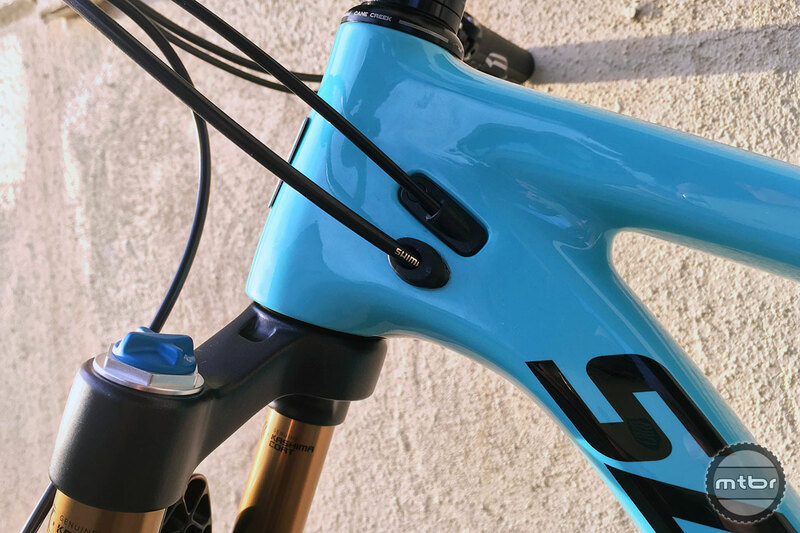 The Highball features full internal cable routing like we’ve started to see on more of Santa Cruz bikes. Internally, there are cable stops that reduce weight versus full housing run. 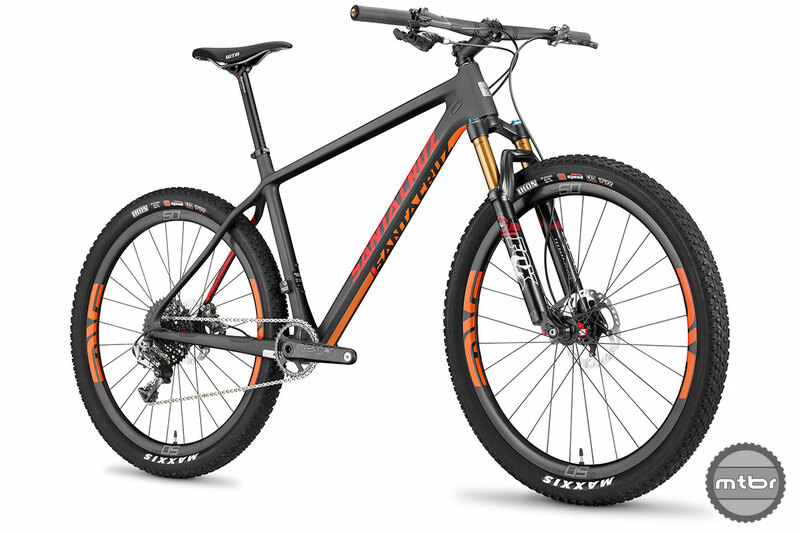 Sizing on the 29er runs M-XXL, while the 27.5 version comes in S-XL, the idea being that shorter riders will need smaller wheels, while tall riders will want bigger hoops. The bikes are available in both Santa Cruz’s premium, lighter weight CC carbon or the less expensive C carbon. 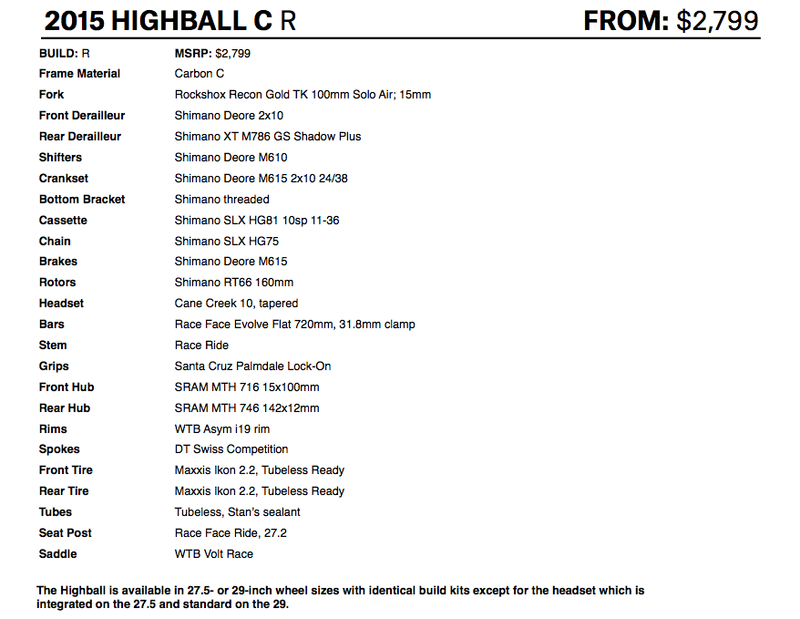 Complete C carbon bikes start at $2,799. 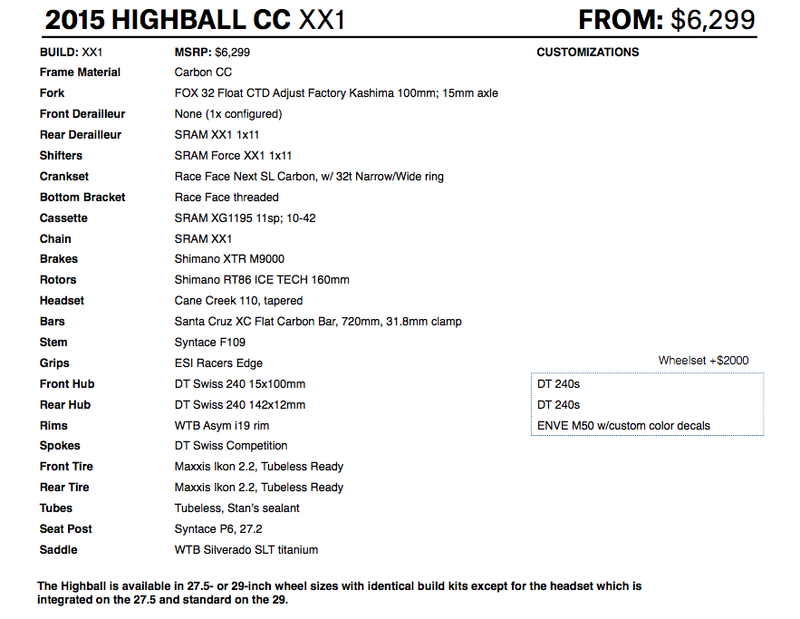 The Highball is available as a CC carbon frameset for $1,899. There’s also a alloy version of the 29er frame. The rear brake hose is internally routed on the Highball’s stays. Other features include a direct mount front derailleur, 27.2mm seatpost, 15mm thru-axle fork, full carbon dropouts and disc mounts, two bottle cage mounts, 142mm rear axle spacing, and a threaded bottom bracket shell. Available colors are gloss aqua and matte black. Bikes and frames are slated to hit dealer floors next week. 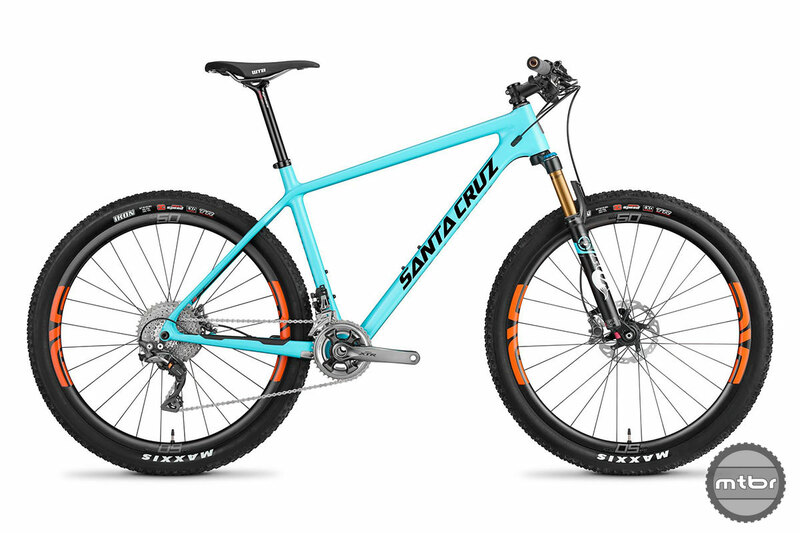 For more info visit www.santacruzbicycles.com, and scroll through the expansive photo gallery below, which includes full build spec options, geometry measures, and sizing info. The non-drive side of the Highball is super clean thanks to internally routed cables. The Highball comes with a direct mounting point for a front derailleur, and a Santa Cruz-branded alloy cover for 1x setups. 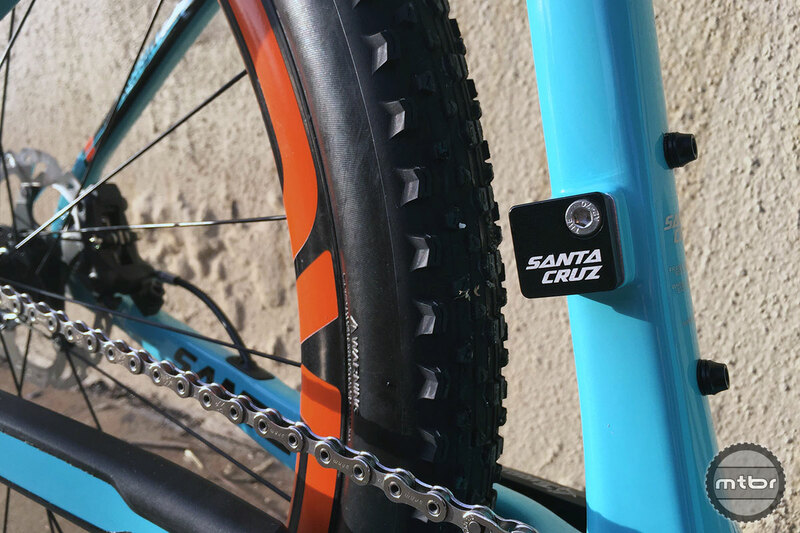 Internal cable routing makes it easier to spot the distinctive Santa Cruz head badge. The bikes are available in both Santa Cruz’s premium, lighter weight CC carbon or the less expensive C carbon. Complete C carbon bikes start at $2,799. Other features include a direct mount front derailleur, 27.2mm seatpost, 15mm thru-axle fork, full carbon dropouts and disc mounts, two bottle cage mounts, 142mm rear axle spacing, and a threaded bottom bracket shell. 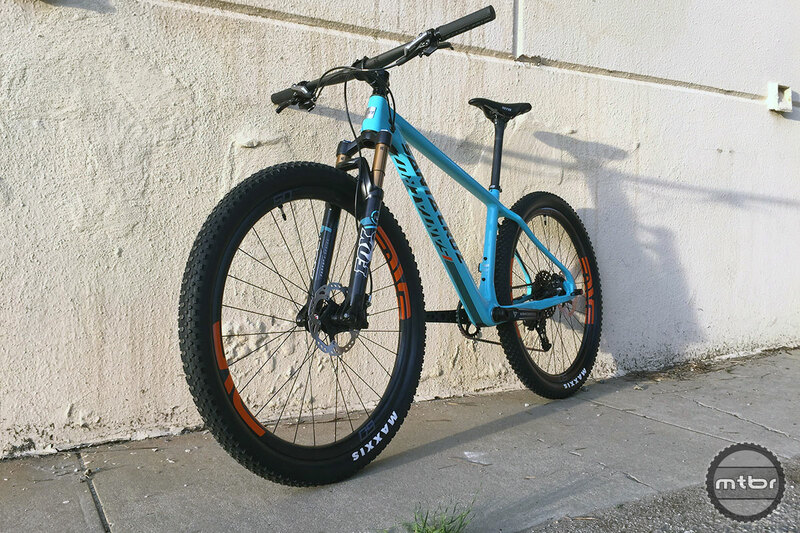 Santa Cruz color matched the graphics of this build’s ENVE carbon rims with hits of orange on the frame. 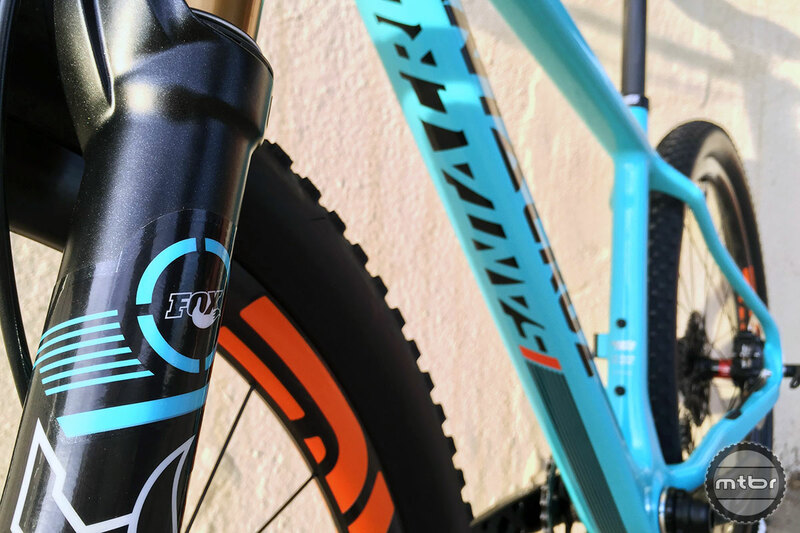 The FOX fork decal is also color-matched to the frame’s aqua blue hue. 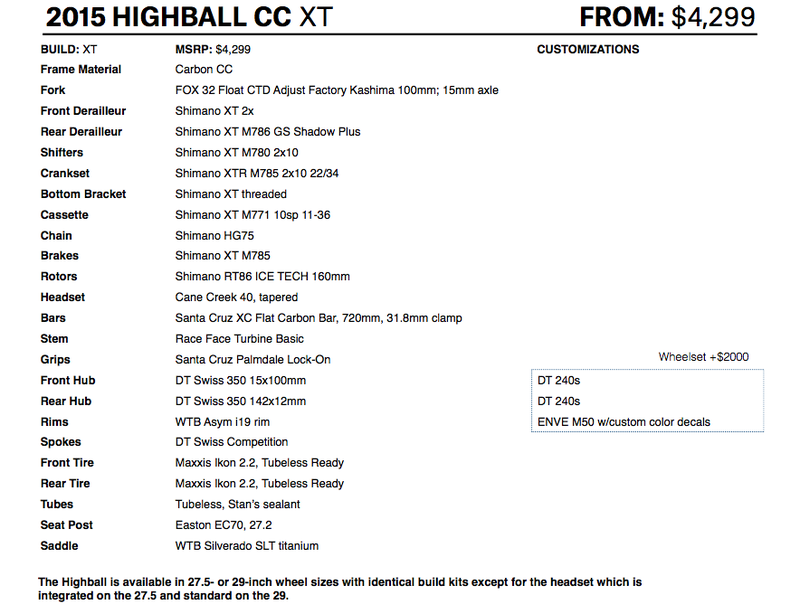 The Highball is available as a CC carbon frameset for $1,899. Available colors are gloss aqua and matte black (pictured). The threaded bottom bracket is great but no proprietary (and well engineered) SS dropouts is just really lame. I hate it when only details of the high end bike are shown, come on! we want to know also a few facts about the alloy version. This is repetitive across all bike mags and websites. What a disgrace. I hate it when people say alloy. Every engineering material is a alloy including “steel” or “aluminum” because they are made of of more than one material. Wholeheartedly agree on the no SS dropouts comments above.. Beautiful looking frame, but why no SS?? So you don’t actually get a choice between playful and fast rolling if you are a shorter rider. 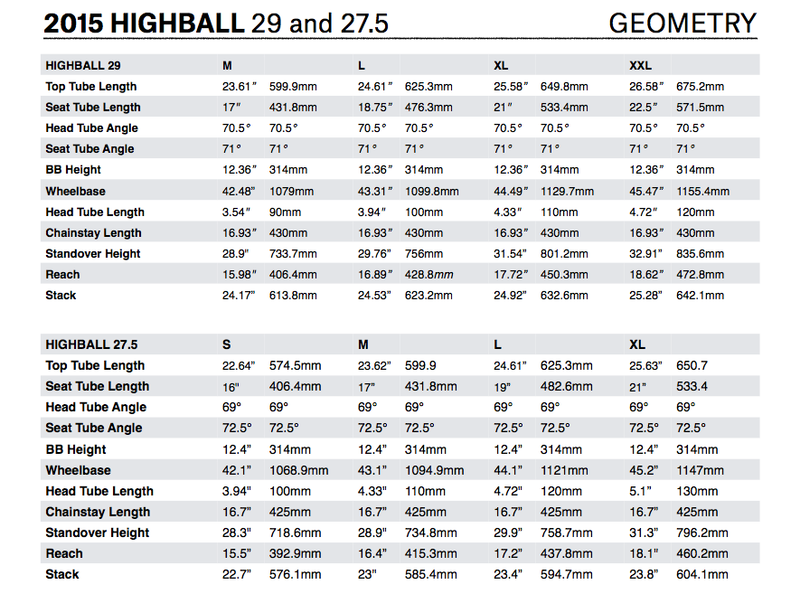 I have a 29’er that fits me great and I can’t fit on the Medium Highball. Ah well. Santa Cruz bikes and me were just not meant for each other. I seriously do not get this desire to route hydraulic brake lines, inside the frame. I’m willing to bet at least 50% of the folks who buy this frame, would buy as a frame only, and move their current parts kit. I’ve been riding 20+ years, and have not purchased a complete bike since sometime around 2000-2001. So now you have this perfectly dialed and bled brake, but you have to disconnect the hydraulic line, and thread it through the frame, and redial the brake. What a senseless waste of time and effort. All this while trying not to get brake fluid inside the frame. Anybody know how DOT fluid reacts with carbon resin, over time? I honestly don’t, but I know it will eat through paint, in no time. After a stream crossing your frame is full of water, and your hidden exposed cables can rust out of sight. Tough crowd. I like it and will consider it for a hardball build. Grouchy bunch I’d say. I like it and look forward to building a 29er up. Great work Santa Cruz! 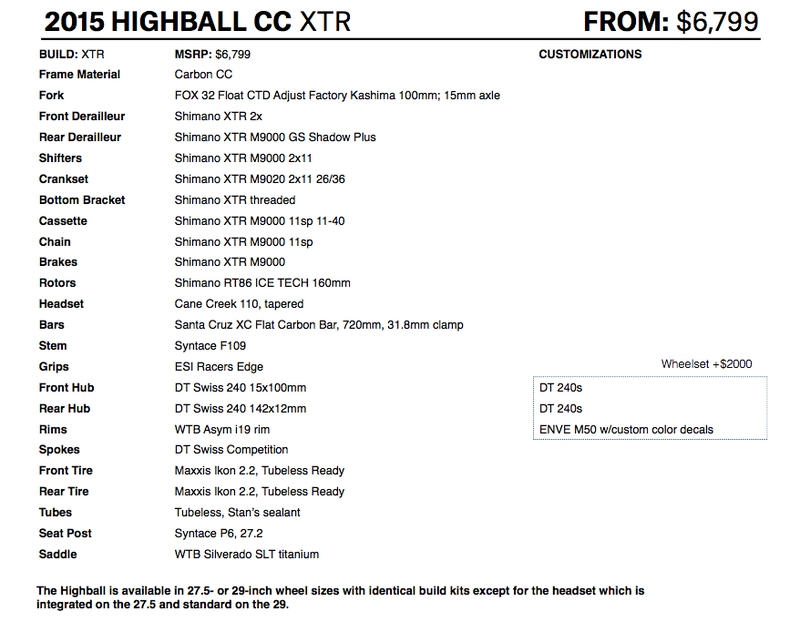 Oh boy… I recommend cable discs for this bike: internal routing is silly. Or how about this: set aside 10% of the total cost for repair and maintenance. Your bike mechanic thanks you. I started to notice the direct mount front derailleur mount on bikes, but it looks like a growth if you are running 1X. As a bike racer, bike mechanic, and avid cyclist I read these posts and think: man, what a bunch of whiners!!! People forget that bikes are meant to be ridden, and this one has all of the right angles. If you can’t figure out how to route internal cables you shouldn’t be working on your own bike. Try routing an electronic group in a frame set sometime…. 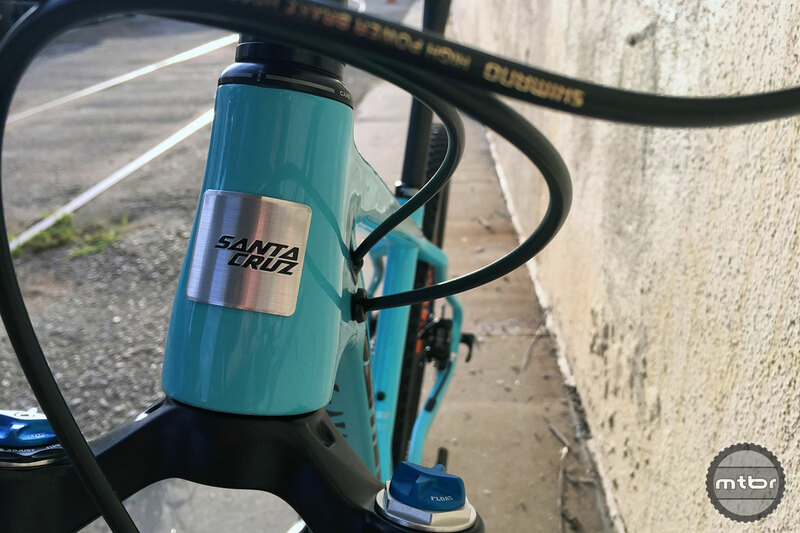 Santa Cruz has manufactured internal guides for the cables so I’m not buying “cables rusting inside” or “mechanical disc brakes are needed for this frame”. LOL!!! 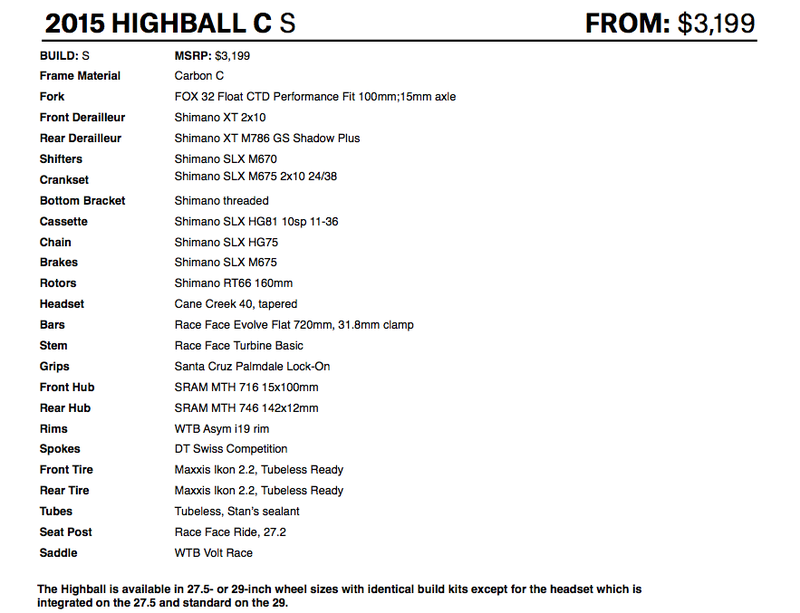 Having done two Leadville Trail 100 races and many XC races on my 26″ hard-tail I’m excited about this bike. Nice job Santa Cruz! Sign me up for one. Good response. Thanks. Bikers, esp. mountain ones can indeed be whiners at times.